Of and concerning the first house, wherein Tommy is caught with his knickers down and his baubles in a hole. Nikki is set on fire to the eminent displeasure of the carpet. Vince covets narcotics on the person of David Lee Roth. And Mick maintains a righteous and bemused distance. While having absolutely nothing to do with the subject of this post, apart from the title, whenever I think about dirt – making dirt – the above book pops into my mind. A gift for my birthday a few years back, it was handed to me with the proviso, ‘I know this seems like an odd present, but it’s really a good read’. And it is. Even if you’ve never heard of or can’t stand Motley Crue (I was in the latter category), this book will drag you in to the sordid, humourous and often sad rise to the status of stadium band by this odd collection of characters. It will affirm everything you ever thought about Tommy Lee, and enlighten you as to the real musicianship of the other three. And even Tommy Lee has a couple of redemptive moments. So, if you’re not into compost, you can stop reading here, and hunt down The Dirt. You’ll laugh, you’ll cry, and you’ll never think about Motley Crue in the same way again. Making dirt, as opposed to reading it, is a whole other kettle of fish. A lot of people seem to be a bit dismissive of compost [committed gardeners excluded], or nonplussed, bemoaning the fact that ‘it never works’. At this point I have to profess to being a bit of a compost snob – it’s not the compost’s fault that it’s not working. Rather, there is some (usually very simple) reason for failed compost, mostly to do with what is or isn’t going into it and where the bin or pile is placed. I obsess about compost and, over the years, I’ve picked up enough tips to make a pretty good version of ‘black gold’, as it’s known in gardening circles. I like the smell of it, I love digging it out, and I am constantly peering in my bins, checking on their progress. The worst experience I’ve ever had with compost was when I was digging it out and a couple of native cockroaches ran up the inside of my jeans. I’m not usually bothered by the critters (if they’re in your compost, they’re assisting with the decomposition process) but it wasn’t a very pleasant sensation. Given the size of my current garden, I’m lucky enough to have space for three compost bins, although one is pretty small. Ideally I’d have an open air system, like the one at West Brunswick Community Garden but, as a renter, it’s simply not feasible. Bins are easily portable and I’ve also been known to move compost from rental house to rental house. As it is, with the three bins I now have, I produce only just enough compost for my garden. Bins 1, 2 & 3 (see feature image for 3) are filled, left to decompose and dug out on a rotational basis. 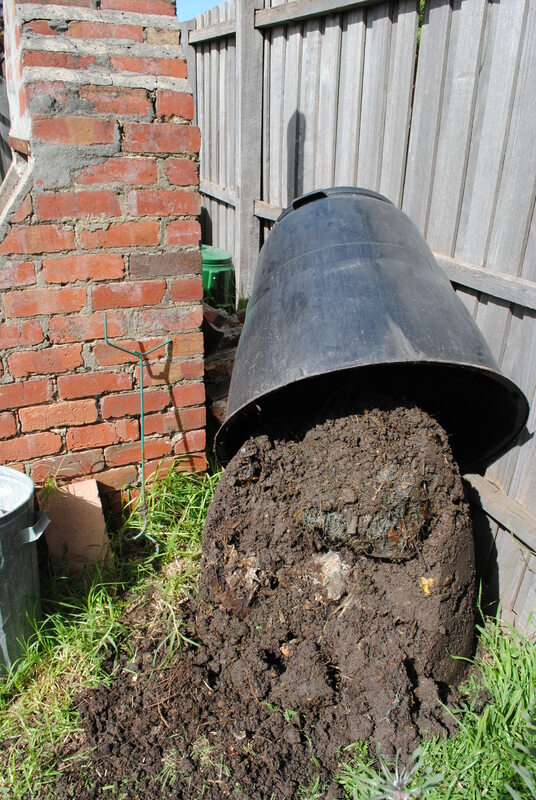 I thought I’d run through some basic composting tips and dispel a few myths I’ve heard going around. The key to good compost, as with life, is achieving a healthy balance. This means mixing up what goes into your compost, paying it some attention, and adding in things that provide elements that might be missing from your food scraps. Compost should be aerobic: this means you should add things like paper, cardboard, leaves, grass clippings or straw/mulch on a regular basis, so that food scraps, tea leaves and coffee grounds (which are very damp) are layered with drier, aerating material. Turn your compost: You should do this a couple of times a month (or more often, if you like compost as much as I do). Basic but highly effective compost turners (a bit like large corkscrews) are readily available. If possible, have two or more bins: This means you can fill one, then leave it to decompose while you are filling the other, and so on, so you always have compost ready at the change of seasons. 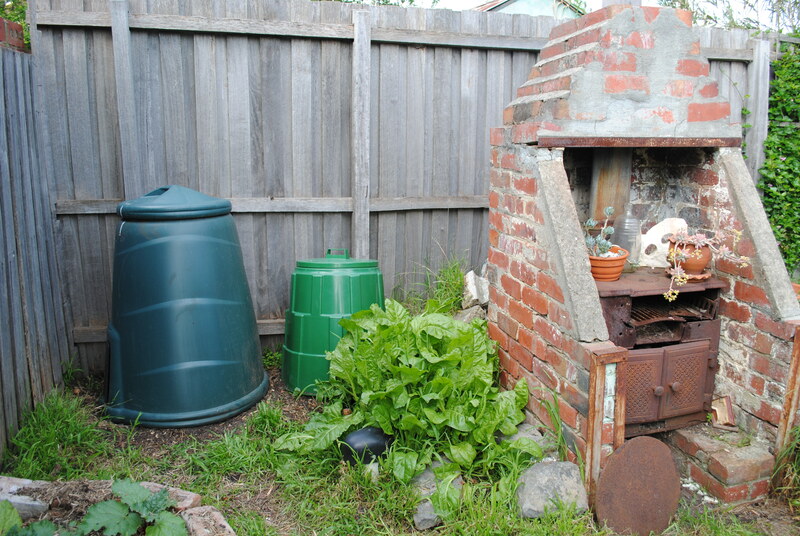 Compost needs heat: A lot of people hide their compost bins away in a dark corner. This is counter-productive, as sun/heat assists in decomposition and you also run the risk of ending up with anaerobic compost (i.e. airless) – in other words, ‘slime’. So, find a warm, at least partially sunny spot for your bin or pile. Don’t be shy about what you put in your compost: Think about what decomposes and what kinds of things it might add to your soil. For instance, on the rare occasion we eat fish these days, given its scarcity and price, I throw any leftovers – flesh, skin or bones – into the compost, as fish breaks down quickly, worms love it and it adds similar nutrients to the soil as Charlie Carp fertiliser. Always use a garden fork to turn or dig out compost: Spades slice through your worms, and you don’t want to hurt your precious workers. What if things haven’t decomposed? If you come across stuff that hasn’t fully decomposed, and you’re using the compost as the base of a new bed or it’s going to lie fallow for awhile, throw it in – it will decompose in the bed. If you’re using the compost as top soil, just throw it back in the bin or pile, for later. Citrus should not go into compost: Not true at all. It’s fine to put all your citrus scraps into the compost as long as they are not in the majority. Again, balance is the key. If you notice that there seems to be a lot of non-decomposed citrus, then you need to add more of something else, and definitely add some friable material, such as paper or straw. Worms get bored on a monotonous diet too. Eggshells should not be put in the compost: Again, not true. While it can be a bit annoying if you have too many eggshells, they make good roughage and break down eventually. A tip would be to break them up a bit before you put them into the compost and, if you have too many, save them to use as snail or cabbage moth deterrents. An anaerobic compost is okay: Well, there might be some debate on this but I’d say, no it’s not. Compost without air is not healthy; it would seem a perfect breeding ground for pesky microscopic things, so should be avoided. A way to rescue anaerobic compost is to spread it out in the sun (if you can stand the smell, which is pretty bad) and dry it out, making sure, when you put it back in the bin, that you add friable material and that the bin is in a well-lit and sunny spot. You need to add worms to compost: Once again, not so. Worms appear, as if by magic, once a perfect environment is created for them, and they reproduce like rabbits. If you have a feeling there aren’t enough worms in your bin, grab some from one of your other bins, Or, if you’ve only got the one bin, you can buy compost worms from nurseries and specialist worm shops if you really think you are low on numbers. You can’t put weeds or grass in compost: Actually, you’d be mad if you didn’t. 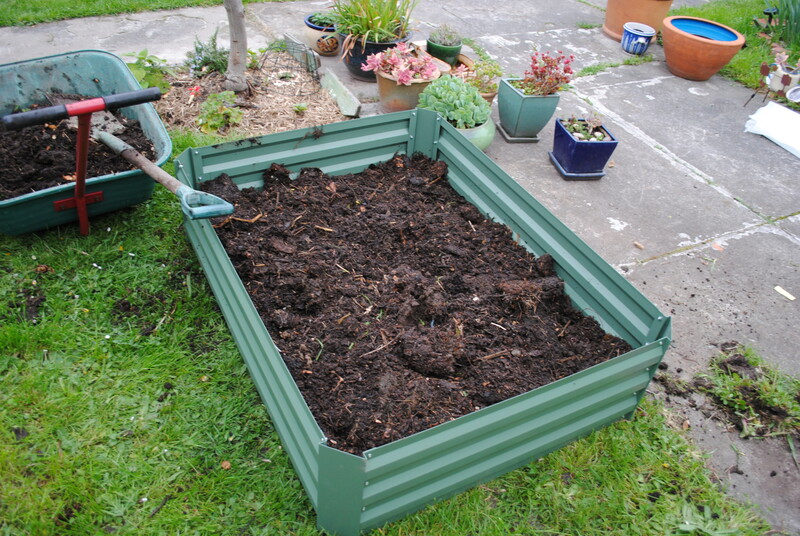 The compost bin is the best place for weeds and grass. Firstly, because they add essential things to the soil, in particular, nitrogen; secondly, because the heat of the decomposition kills off the seeds and/or roots of weeds and grass. That said, I wouldn’t put couch grass, mallow, potato weed or ‘sticky’ weed in your compost. You should also NEVER compost a diseased plant, or any material from a diseased plant, such as the leaves. It’s a very satisfying experience to produce rich, friable compost from your own bins. Above is the portion of my garden that has been left fallow since last summer for this year’s batch of tomatoes. Periodically I add manure or compost to build up the soil, getting it ready to plant the tomato seedlings in a few weeks. This damn fine looking dirt came from the my large green bin (the far left of the three), which had been decomposing over the winter (a slow time for compost), and I spread it out a month or so ago. In the past two weeks, we’ve emptied two of my bins (the big ones) and used the compost to fill two new garden beds. The easy-to-assemble steel beds were from Aldi, for $40 each, and somewhat solved the perennial space issue (i.e. the more you have, the more you need). 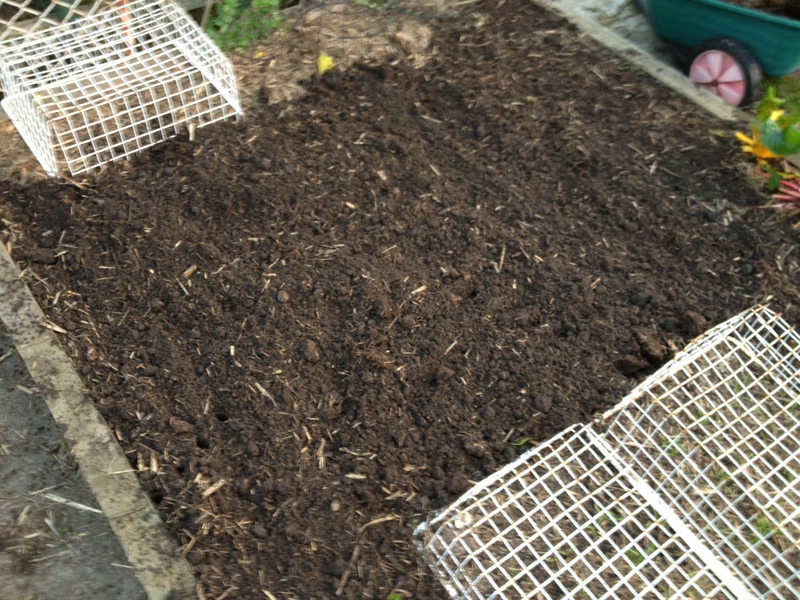 The compost from the two bins was perfect – rich, friable and full of worms. This, plus a few bags of manure and some ash (potash) makes for a perfect blend of nutrients and good microbes. Always cover your compost with mulch of some sort after spreading it and water it down, as your worms don’t like their home to dry out. I only waited a day or so to plant out this bed, as compost is one of the few things you can plant straight into with no major issues. And I’m very impatient. 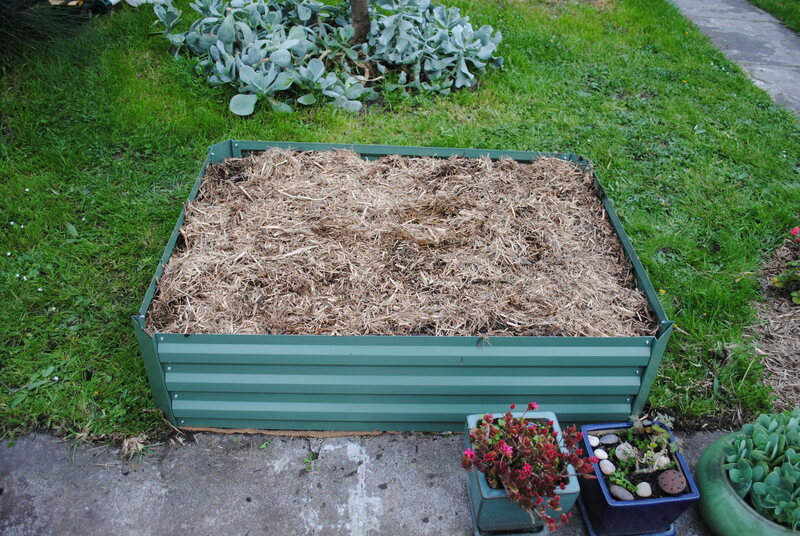 Ideally, you should leave the composted bed for at least a week, or, like the fallow bed discussed above, for six months or so. So there it is, the dirt on dirt. In the next few days I’ll be posting about planning your summer garden, which ties in neatly with planning your compost system. And one of the best things about using compost is the fact that you get lots of self-sown summer vegies, including zucchini, pumpkins and tomatoes. It’s kind of exciting, waiting for them to pop their little heads up, never knowing what you might get, or where they might turn up. Any questions, advice or comments on compost gratefully received! A couple of things: anaerobic compost is not BAD, it’s just slow, there’s no reason not to have a “slow cold” pile as well as a couple of fast hot piles. There are problems with cold piles, not least of which is the potential for pests, so it’s extra important not to put in meat and other pest attracting scraps. Secondly as I was told many years ago by an early teacher in horticulture, “Dirt is what you get under your finger nails, soil is what you find in the ground, compost and potting mix are different again”. Ok Doctor, you’ve got me. My compost snobbery extends to anaerobic compost, and I really don’t like it. But you are right – it’s not bad, as such. However, there are degrees of anaerobic, and if a compost is just sitting there, smelling really bad and attracting flies, etc, it’s not good. My advice to those with this kind of compost is to either leave it out in the air for awhile or dig it in, as a bottom layer. And it’s true that putting meat scraps in an anaerobic pile is going to exacerbate the problem.